Greenlawn and Oyster Bay Taste Best! The NSWCA is extremely proud to announce that our commissioner-led water districts have taken the top prizes for Best Tasting Water in both Nassau and Suffolk Counties at the Tap Water Taste Contest. 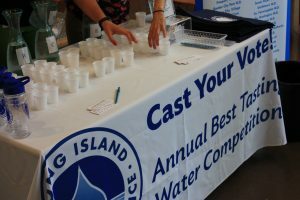 In Nassau no one has better tasting tap water than the Oyster Bay Water District, according to the the tasters who sampled and voted at the Campus Center at SUNY Farmingdale May 7th through May 10th. 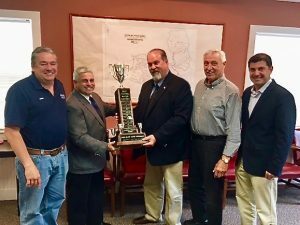 And in Suffolk, the Greenlawn Water District’s tap water tasted best and the District took home the trophy for the eighth time . Congratulations to the dedicated staff and superintendents of both winning districts, to Oyster Bay Commissioners Robert J. McEvoy, Richard Niznik and Michael F. Rich II, as well as to Greenlawn Commissioners John McLaughlin, Jim Logan and John H. Clark. 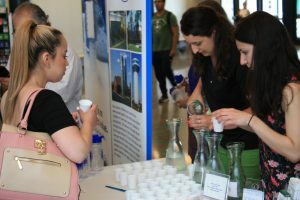 Both winners will be entered into the regional competition which eventually culminates in the New York State Fair in Syracuse to determine the best tasting water in the entire state! Winners at the regional and State Fair competitions receive recognition plaques from the judging body, the Water and Wastewater Education and Outreach Committee (WWEOC). Above Right: Left to right: Greenlawn Water District Commissioners John McLaughlin, Jim Logan, John H. Clark, and Superintendent Bob Santoriello. Oyster Bay Water District receiving the Nassau County Trophy from Chuck Savinetti, Superintendent of Locust Valley Water District and Chairman of the LI Water Conference. 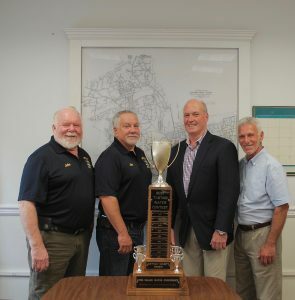 Above Right: Left to right: Oyster Bay Water District Superintendent John W. Walsh, Mr. Savinetti, Oyster Bay Commissioners Robert J. McEvoy, Richard Niznik and Michel F. Rich III.